The number of remaining teams in the Women’s World Cup is dwindling. Only eight nations still have the chance to claim the world title and bragging rights for four years. The Round of 16 gave us plenty of drama and excitement, and the quarterfinals are sure to bring us more of the same. Lets take a quick look back at the Round of 16 matches. China 1-0 Cameroon: My big upset bid fell short here, as China dispatched their opponents. Cameroon looked dead tired in the 2nd half, suggesting that they exhausted themselves in the group stage. The Chinese got their goal from Wang Shanshan in the 12th minute, and played the entire rest of the match with that slim lead. USA 2-0 Colombia: The US did not play very well in this game, but still manages to put 2 goals on the board and shut out their opponents. The first half was scoreless, but the second half was all action. Colombia’s started the game with backup goalkeeper Catalina Perez due to Sandra Sepulveda’s card-induced suspension. Perez took down Alex Morgan in the box to earn her own red card. That left the final goalkeeper on Colombia’s roster, Stefany Castano, to come in for the rest of the match. She started off well, as Abby Wambach sent her penalty kick wide. The Americans did get 2 goals from Alex Morgan and Carli Lloyd while playing 11 on 10. The bad news for the US is that Lauren Holiday and Megan Rapinoe both picked up their 2nd yellow of the tournament, leaving them unavailable for the quarterfinal against China. 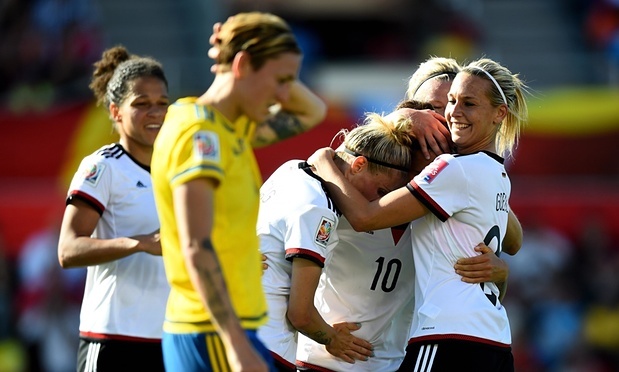 Germany 4-1 Sweden: The Germans took a 2-0 lead to halftime on a goal from Anja Mittag and a penalty from Celia Sasic. Sasic got a goal in the 2nd half as well in the 78th minute. Sweden pulled within 2 with a goal from Linda Sembrant, but Germany shut the door for good with the fourth goal from Dzsenifer Marozsan. 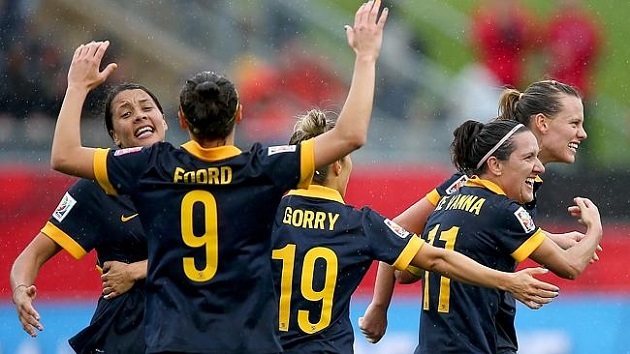 It spelled the end of a disappointing tournament for Pia Sundhage’s squad, who are ranked 5th in the world. It is amazing that the German team is still dominating without their best player, Nadine Keßler, who is out of this tournament with an injury. France 3-0 South Korea: The group stage cobwebs were nowhere to be found, with France getting 2 goals in the first 10 minutes from Marie-Laure Delie and Elodie Thomis. The French got another one just after halftime from Marie-Laure Delie, resulting in the final scoreline of 3-0. The French did a great job in avoiding costly disciplinary action, only getting one yellow for sub Kheira Hamraoui. That means their entire roster will be available for the quarterfinal against Germany. Australia 1-0 Brazil: The first match on the bottom side of the bracket had Australia pulling a shock upset of Brazil. Sub Kyah Simon got the only goal of the match in the 80th minute, pulling off the biggest shocker in the knockout stage. Marta and Brazil just couldn’t get anything going on offense, and the Australians move on to the quarterfinals. Japan 2-1 Netherlands: They got a goal in the 10th minute from Saori Ariyoshi, with Mizuho Sakaguchi adding another in the 78th. The Netherlands didn’t give up though, getting a goal back in extra time from sub Kirsten van de Ven. The Japanese have flown under the radar the entire tournament, but the lights will be on as they take on Australia in the quarters. England 2-1 Norway: The biggest toss-up in the Round of 16 was Norway vs England, and the match reflected that. The first half was scoreless with both teams getting a bevy of chances. The second half was just as exciting. Norway got on the board first with a goal in the 54th minute from Solveig Gulbrandsen. 7 minutes later, Steph Houghton got an equalizer. Then, in the 76th, Lucy Bronze got the goal that would become the game winner. They now move on to the quarterfinals against hosts Canada. Canada 1-0 Switzerland: The final Round of 16 match featured the hosts against the Swiss. It only takes 1 goal to win, and that is what happened. Josee Belanger got that single goal in the 52nd minute. Canada hasn’t been the flashiest squad, but they have done enough to get the job done. The hosts are hoping to go all the way in front of the home fans, and now they face England in the quarters. A top 5 matchup that might be the most anticipated in recent history. Nadine Keßler’s injury and France’s early loss have given doubts to both of these squads, but there is plenty of quality to go around. Germany has passed every test so far, but they haven’t faced a squad with the talent that France has. This match is the “must watch” of the quarters. I’m taking this one to penalties where the Germans excel. This isn’t your China of old. But then again, the USA also has some key players suspended. The midfield will be the key for the United States in avoiding a shock upset. China always plays with discipline, and won’t make many mistakes, it will take a real effort to break through their defense. I think the USA continues their march for a 3rd World Cup title with a 2-0 victory. Fresh off a big upset, Australia will attempt to continue the party all the way to the semifinals. The defending champions are standing in their way. Each of these squads have scored some big victories in this tournament. This will be the toughest opponent for Japan, but they have the experience that says they can win. I like Australia’s Cinderella run and see them moving onto the semifinals. The final quarterfinal has the hosts facing off against the Three Lionesses. Canada has used their home crowd support to propel them this far in the tournament. England is coming off of a come from behind victory over Norway, so they might be a bit drained from that emotional match. I like the hosts to move on to the semifinals.